Ptosis is a condition in which the upper eyelid(s) droops. The eyelid may droop only slightly or it may droop enough to partially or completely cover the pupil, restricting or obscuring the field of vision. Ptosis should not be confused with extra skin, fat, or muscle to the eyelid, which are typically addressed with blepharoplasty surgery. When Ptosis can be shown to reduce vision (peripheral vision), its correction is covered by most insurance plans. This can be determined at your consultation by the results of a visual field test. If the degree of Ptosis is not as severe (does not affect vision), it is considered elective surgery and can be corrected as a cosmetic procedure, which is not covered by insurance. The most common type of adult onset ptosis is due to a weakening of the attachment between the levator muscle (the muscle that raises the upper lid) and the eyelid. This may occur as a result of the aging process, after cataract surgery or contact lens wear, or from an injury. Ptosis surgery is an outpatient procedure involving tightening of the muscle that lifts the eyelid. The surgical approach taken depends on specific findings and testing performed during the preoperative evaluation. 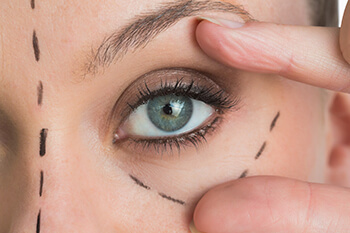 In many cases the excess skin or fat may be removed by performing a blepharoplasty at the same time. Your surgeon at Eye Physicians of Long Beach will discuss your treatment options fully and will perform all the proper testing to determine whether your ptosis is deemed medically necessary and will be covered by insurance or if it is cosmetic.